Easter is supposed to be a time of love and forgiveness… it’s a time for personal reflection and giving thanks to God. Not for shooting random people at Easter carnivals. In Birmingham, Alabama (which has been in the news a lot lately), someone shot a baby that was less than a year-old and three teenagers. All will recover thank goodness. About 900 people were at the carnival with 100 waiting in line when this happened. Police have taken five people of interest into custody, but they haven’t actually arrested anyone yet. This could have been much, much worse. Oh, did I mention the carnival was at a church? The Cathedral of the Cross church to be exact. This happened last night. What is wrong with people? Police have no idea what the motive was for the shooting. Could it be because they were Christians? Just sayin’. Hundreds of people ran in terror for their lives when the shots rang out. We are lucky that no one got trampled to death during all of this. 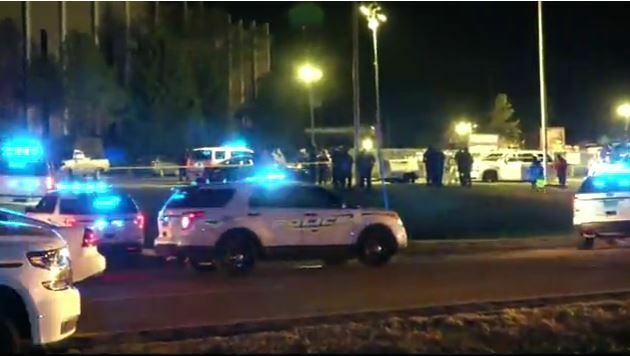 Three teenagers and one infant were shot Saturday night at an Alabama church’s Easter carnival, officials said. The victims’ injuries are not life-threatening. Center Point Fire Chief Donnie West told reporters that first responders headed to Cathedral of the Cross in Center Point — part of the Birmingham metropolitan area — around 9:23 p.m in response to a possible shooting. The teenagers were transported to UAB Hospital’s trauma center, and the baby was taken to The Children’s Hospital of Alabama, both in Birmingham. It is unclear what prompted the shooting. ABC affiliate WBMA reported that 900 people — including 100 who were waiting in line — were at the carnival at the time of the incident. According to WBMA, the Jefferson County Sheriff’s Office has taken five people into custody for questioning. The investigation is ongoing, and will be led by the Jefferson County Sheriff’s Office. “You either jumped the fence or you got shot. I just thank the Lord Jesus Christ that we’re still here,” regular attendee Felicia Stubbs told AL.com. The local fire chief described the scene as “mass chaos,” but said things could have ended tragically if not for the fact that several local deputies were working off-duty jobs at the carnival and immediately sprang into action to capture some of the suspects. “This could have been extremely bad,” said Center Point Fire Chief Donnie West. A pregnant woman was also taken to the hospital for minor injuries she received when she was knocked to the ground by people running from the gunfire. The shooting happened just before 9:30 pm. A 10 year-old was briefly missing, but was later found unharmed at a nearby restaurant. A man knocked down a portion of the fence and people escaped through that opening. “We were all running,” she said. “I could have lost my kids and my life.” Approximately 60 Birmingham police and Jefferson County deputies and 35 firefighters went to the scene. In the 15-year history of the carnival, something like this has never happened before.